A few surprises came from the SBC Convention in Las Vegas, NV this month. I'm super stoked to share this one with you ... Every single distributor (both new and existing) have the chance to win a 2014 Chevy Camero (brand new / fully loaded) and earn multiple entries, too!!! How does this Skinny Fiber Contest work? For a chance to win this 2014 Checy Camero, you get 1 entry for each 3 sales from now until the end of the promo ... So, 6 sales = 2 entries, 30 sales = 10 entries, and so on. Everyone who joins me as a Skinny Fiber Distributor and gets at least 3 sales, has a chance to win this car! Company pays Skinny Body Care Independent Distributors free money via rank bonuses in the amount of $250, $1000 (Laptop Computer Bonus), $5000 (Vacation Bonus), $25,000 (Car Bonus), $100,000 (Car Bonus), $300,000 (House Bonus). 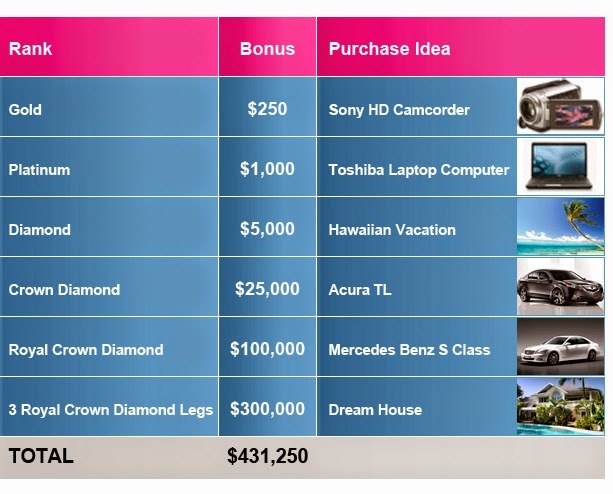 This is the potential to earn $431,250 in bonuses in addition to regular income. SBC is one of the only company that helps you own a new car or home flat out; no installments! You just have to put in the work! 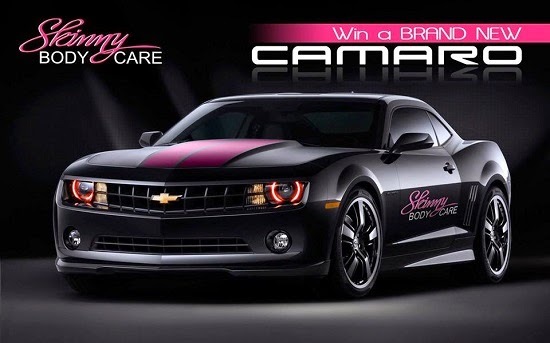 Become a distributor and you may be the winner of this beautiful 2014 Camaro!!!! BOTH new and old distributors have the same odds of winning ... I want someone I know to be the proud owner of this fully loaded 2014 Chevy Camero in February!!!!! Please feel free to Contact Me directly with any questions! Look, it's not just the car ... There is an incredibe opportunity for you here! If you have been looking to supplement your income or career change, as well as lose weight and help others do the same, start this work at home business with our team and change your life! Whether this car or the one you can earn with the bonus you get from the company (free money on the chart above) and YES, the company pays the bonus as a one time payment --- not a crappy lease --- the car is yours flat out. The sky is the limit with SBC. It is just about your wanting to make the change and you MUST LOVE helping people!